The purpose of the Cottey Dance Department is to enhance physical, intellectual, emotional, and social aspects of students’ development. The Dance Department at Cottey allows students to explore dance in a liberal arts setting, where the topics of biology or history classes overlap with topics in dance classes. The view is of dance within the world, not dance as the world. It is important to the faculty of the Cottey Dance Department that students maintain a panoramic world view, one in which the field of dance is enhanced and in turn, enhances, their other coursework and life activities. This view benefits students who only take one dance class while at Cottey as well as students who complete the Associate of Fine Arts (AFA) degree in Dance or minor in Dance. For the student interested in a career in dance, dance degree programs focus on the development of performers, choreographers, and educators, and encourage the emergence of new, diverse, and creative dance techniques and styles. Although a college degree in dance is not necessary to perform, it is necessary for those who want to teach dance in college, high school, or elementary schools. A dance degree also provides a foundation for those who want to develop a business or career in the arts. Many dance majors explore careers in fitness and the health sciences. Click here for information about Dance Scholarships. Click here for a printable brochure about Dance at Cottey. The Cottey Dance Department offers these classes for beginners, no previous experience needed: Ballet, Modern, Jazz, Tap, Improvisation, Musical Theater Dance, Dance Appreciation, and Yoga Ansanas. Dance Appreciation provides a conceptual and philosophical approach to watching dance. Yoga Asanas? Practice of physical postures to increase strength, flexibility, and balance. Membership in the Cottey-in-Motion (Co-Motion) Dance Company is by audition. The Company performs 4 times a year, including a formal concert each semester. Students who take the Choreography class may have their dances on the formal concerts. Students can earn their Associates of Fine Arts degree (AFA) or minor in Dance at Cottey. Variety of opportunities for dancers of all levels: Classes are offered in multiple dance techniques, appreciation, creation, and performance. Small Class Size: As with all disciplines, small class size gives each student the advantage of individualized attention. Because so much of assessment in a dance class is based on visual observation and immediate feedback, fewer students in a class give the instructor the opportunity to focus on each individual student more of the time. Hence, each student gets more feedback and more opportunities to apply that feedback and improve. Dance technique classes are usually capped at 16 students. All classes open to all students: In many college dance departments upper level technique classes and specialized classes such as Improvisation are reserved for dance majors and minors only. We allow any Cottey student in any course, providing pre-requisites are met. Facilities: The Dance Program has two beautiful, spacious studios with sprung floors, mirrors, and ballet barres in the new Rogers Fine Arts Building. Students have access to studios seven days per week. Student dance performances are given in the Haidee and Allen Wild Center for the Arts. 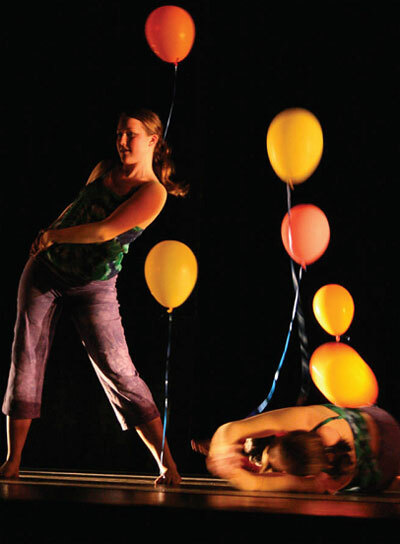 Cottey-in-Motion Dance Company: Cottey Students may audition for the Cottey in-Motion (Co-Motion) Dance Company, whose members learn and perform choreography by faculty, students, and guest artists. The Company meets as a class and usually performs twice a semester. Many college departments have performing groups, but the groups are not always a scheduled class; the students and faculty meet on evenings or weekends to rehearse, more as an extra-curricular activity. Having the Dance Company as a class displays the college’s commitment to having a strong dance curriculum. Performance Opportunities: Cottey Students may perform in an Informal and Formal Dance Concert each semester. The Informal Dance Concerts include performances by students enrolled in dance technique classes, and the Formal Dance Concerts are performances by the Cottey in-Motion (Co-Motion) Dance Company. Scholarships and Work-study: There are opportunities for talent-based scholarships in dance. Dance Scholarship applicants must have applied and been accepted to the College. There is one paid Dance Department Work-Study position. For further information contact the Office of Enrollment Management toll-free at 1-888-526-8839 or by e-mail at admit@cottey.edu. Alums: Students from the Cottey Dance Department have gone on to prestigious dance programs at transfer institutions such as Cornish School of the Arts in Seattle, Columbia College in Chicago, Mills College in Oakland, CA, Arizona State University in Phoenix, AZ, and the University of Maryland. Cottey Alums are teaching and performing in many cities across the United States. Students can earn their Associates of Fine Arts degree (AFA) in Dance at Cottey. Students from the Cottey Dance Department have gone on to prestigious dance programs at transfer institutions such as Cornish School of the Arts in Seattle, Colombia College in Chicago, Mills College in Oakland, CA, Arizona State University in Phoenix, AZ, and the University of Maryland. Cottey Dance Alums are teaching and performing in many cities across the United States. demonstrates above-average dance technique and performance quality in a variety of dance styles. demonstrates good working relationships with colleagues to ensure successful, positive experiences in rehearsals and performance. creates dance works with focused concepts and aesthetic quality. integrates ideas across areas of study and experience into her development as an artist. For Dance Minors, all DAN activity credits count toward graduation. Dance Minors should be enrolled in a dance activity class every semester.